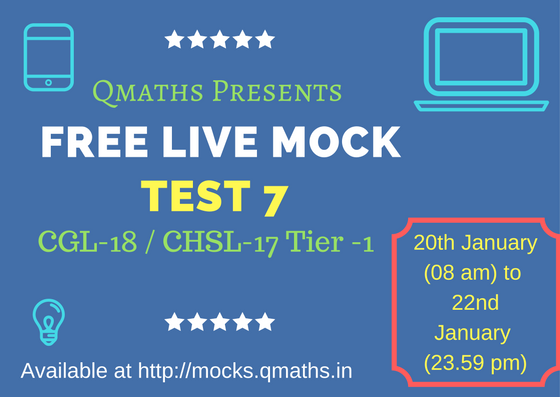 We are very glad to announce that Team Qmaths has offered free weekly LIVE MOCK TESTS for SSC CHSL 2017 / CGL 2018 Tier-1 for its followers. You may avail the live test as per the following schedule. 1) Questions: The Questions provided in its online test were very similar to actual questions asked in SSC CGL exam updated to revised pattern and it's difficulty level is also very good. 3) Immediate Percentile & Solutions (Paid Test): All India percentile (for every section) and explanatory solutions are available immediately after submitting each test. This helps you to determine your relative position among other SSC CGL aspirants and there is no need to wait, the solutions with explanation are immediately available. 4) Smooth Glitch Free Interface: The site has almost no technical glitches and is one of the best sites when it comes to User Interface. Our mock test uses actual SSC theme which is used at the time of the exam. 5) AAO Mocks: We are proud to provide the top class AAO Mock tests which are a result of joint collaboration of Last Year AAO Topper (AIR-1: 185 Marks in AAO), Well qualified Charter Accountants, And some of the Govt. Employees working in the same sector. We guarantee the best quality and relevant Questions for Assistant Audit/Accounts Officers Paper. It is available only in the English language. Your feedback and suggestions are most welcome. Please write us at qmaths.in@gmail.com regarding any queries or suggestions.